If you’ve created a portable document format file (PDF), you probably assume it will continue working in the future. Unlike a hard copy that could be damaged, a digital copy is sound. You should be able to open it up five or ten years from now and it’ll still work, right? That’s the whole point of a PDF: it’s a permanent document that can’t be changed. But this isn’t quite how it works. Your PDF may not be compatible with future versions of PDF reading programs. To ensure your document remains accessible in exactly the same format, you need to create a PDF/A version of the file. By following some principles of interoperability, your file will remain as you intended no matter what program you’re using to open it. Converting your PDF into a PDF/A in Adobe Acrobat is simple. You can select Save As and then PDF/A. You can also save a Word file in this format by selecting Save As, selecting PDF from the dropdown menu, selecting Options, then clicking the PDF/A compliant box. However, you must first ascertain that your document is ready for PDF/A conversion. Future programs may or may not support these additional features, so limiting these particular categories means you will have a standardized file that will still operate in the future. To convert your PDF into a PDF/A file that meets these guidelines, you need to use a validation system. Programs like FoxIt PhantomPDF, veraPDF, and 3-Heights validate files so they will remain usable in the future. These programs are inexpensive or shareware. 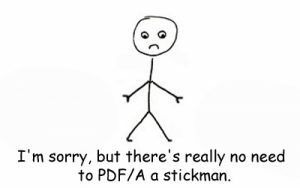 Any organization dealing with important documents may want to consider validating their PDF/A files. For real estate, law, contracts, and finance, creating durable documents is crucial. Validating your PDF/As also means they’ll appear in a standard format with no alterations, guaranteeing the quality of the documents. Any time you want to maintain a complete archive with long-term readability, PDF/A validation may be useful. Many organizations are culling their existing archives to see if they meet ISO standards. This is a time-intensive process but may be worth it to secure documents. Large businesses may find it useful to outsource validation to a service that validates large batches of documents at one time. FoxIt’s PDF compressor is designed specifically to handle multiple documents simultaneously. The bottom line is that to guarantee long-term relevance of digital documents, the best solution is to create PDF/A files. Doing so guarantees strong database protection.